If you’re a gentleman with a beard, or you know one, you know that beards can be unruly and unmanageable. Taking care of your beard is more complex than most men realize. Just like the hair on your head might need a wax or pomade, your beard requires the right products to keep it looking its very best. This is where beard oils come into play, allowing the beard to grow healthily and without issues, and ensuring that it has that glossy sheen that you want. You can expect a great number of benefits from beard oils, including ensuring that it is easier to manage and comb through, that beardruff (similar to dandruff) does not develop, and that your beard smells clean. All of this will allow your beard to look its best. It is important to know that the longer your beard is, the more you will need the oil, so choosing the right one can make all of the difference. Below, we will review ten great products that you should definitely consider. As such, there are a plethora of products on the market that aid in making you (or your bearded one) look less homeless and more put together, important if there’s a job or reputation on the line. Beard owners have a choice between oils, balms, and butters to keep their beards looking in tip-top shape. Oils provide convenience and expediency over balms and butters. They’re easy to apply and good to travel with. Usually they are packaged in small bottles with glass droppers integrated into their caps. Price points range from conservative to costly, each providing different ingredients to fulfill different needs. 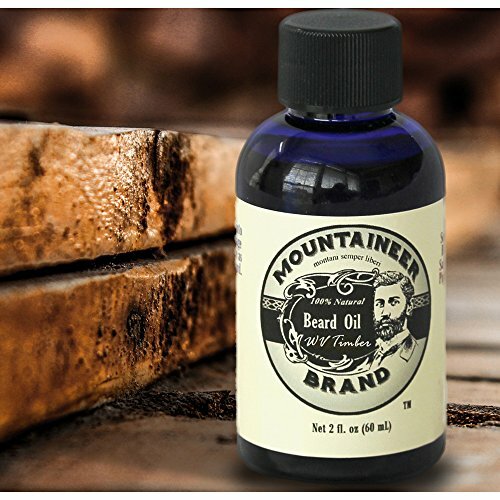 This all natural oil is perfect for beards of all sizes. Unlike other oils, this one is guaranteed to be mess free, making it also a great option for mustaches, especially if you don’t like using mustache wax. Viking beard oil is made with natural ingredients like avocado oil, argan oil, pumpkin seed oil, castor oil, almond oil, and vitamin E. For beards that are curlier or get tangled easily, a few drops of this oil can make combing easier and can have lasting anti-frizz results. All you have to do to use it is rub a few drops right onto your beard! 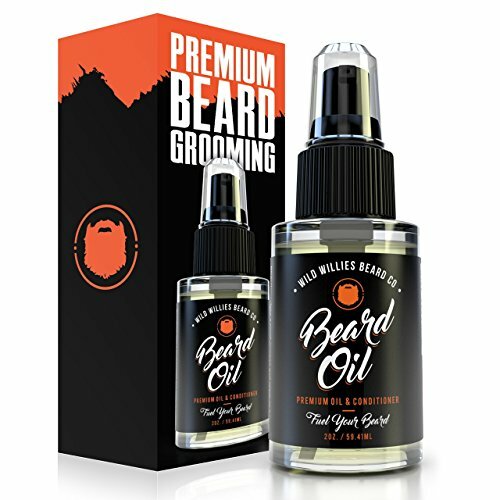 When you want a beard oil that conditions as well as promotes growth, then this could be an option to consider. Users have described that it can stimulate hair follicles so that beards grow more easily and do so in a fuller manner. The organic ingredients can ensure that no harsh chemicals get near your face. This products has argan oil, rosemary, tea tree oil, and so many other oils that can keep your beard tangle free and soft. 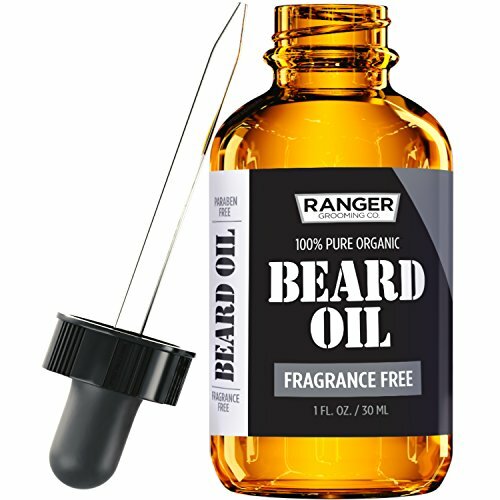 For men who want to have soft, easy to comb, beards but who do not want fragrance in their beard oil, this is a product that can offer that options. This oil contains no parabens, fillers, fragrances, or harsh chemicals which can irritate more sensitive skin. It does contain vitamin E and evening primrose to help combat itchiness, which some men can experience, especially when first growing the beard. It is an oil option that also helps combat split ends. All you have to do is rub a few drops on your hands and massage them into your beard. If your beard is thinning, if it itches and is very dry, or if it has started to fall out, then a product like this one offers to help. Customers who have used it like the simplicity of the oil, with only a mild scent that has a hint of vanilla in it. It is an oil that can help with flakes, if you begin to experience them, and that can even reduce itchiness and skin sensitivity. Because it has jojoba oil, you can expect to have a soft beard that is full and healthy. The fresh timber scent of this oil makes it a favorite for many men. It is a good choice for men with sensitive skin because it will hydrate it and prevent it from flaking, which can sometimes happen when growing a beard. It is a vegan product, as well, so you will not have to worry about it being tested on animals, and it has no artificial fragrances that can leave an unpleasant scent. Because the oil is easily absorbed by skin, you will not feel greasy or oily. This beard oil has a delicious bay rum scent that is never overpowering. It has coconut tones, as well, for a tropical scent that is mild but lasting. This oil contains tea tree extracts, apricot oil, jojoba oil, aloe vera, and vitamin E, to leave your beard soft and your skin hydrated underneath it. It stimulates hair growth, as well, so many customers who have trouble growing beards have started turning to this product. 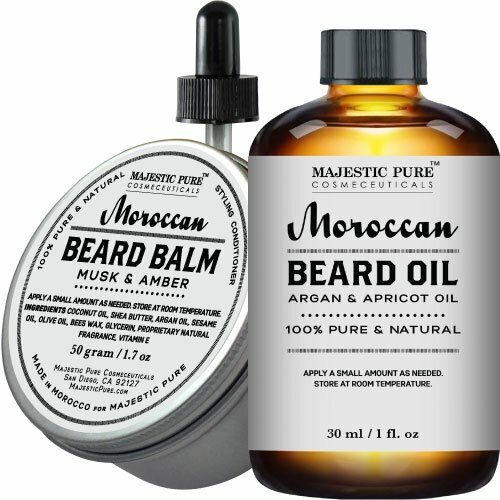 For men who want a touch of the exotic in their beard care, this is an oil that comes directly from the Kingdom of Morocco. It has all natural ingredients, with no chemicals that can irritate your skin, and it provides the kind of nourishment that your beard needs to grow as healthy as possible. The sesame oil it contains can help prevent grey hairs, can ensure your beard grows full, and can even protect from sun damage. Not every beard oil has sesame oil, so it is important to consider this when choosing one. The shea butter and olive oil keep your beard looking shiny and feeling soft. This beard oil has one thing that many do not: ingredients that have antioxidants. This oil is made with fruit oils and extracts that are high antioxidants which promote not only healthy hair growth, but also healthy skin. You can put it on and forget about it or if you prefer, you can also wash it off while still retaining its effects. 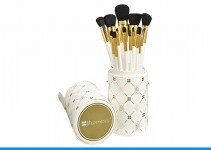 It has great conditioning powers and has a light fragrance that does not overwhelm. Despite its funny name, this is a serious contender for best beard product. It comes in four different scents and uses only natural ingredients to promote skin health. 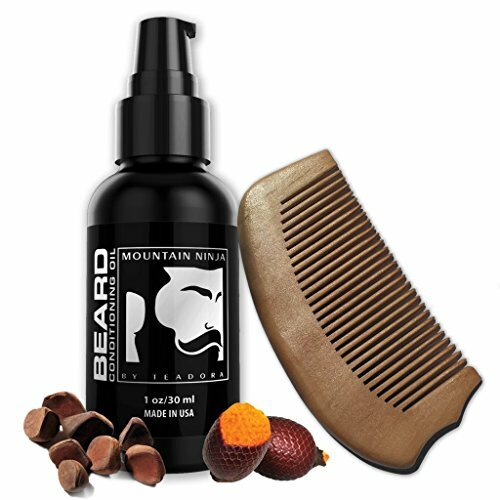 The fatty acids and vitamins it contains help keep the beard supple and will ensure that it remains strong as it grows. 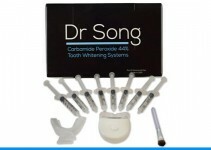 A few drops go a long way with this product, so a bottle can last a substantial amount of time. 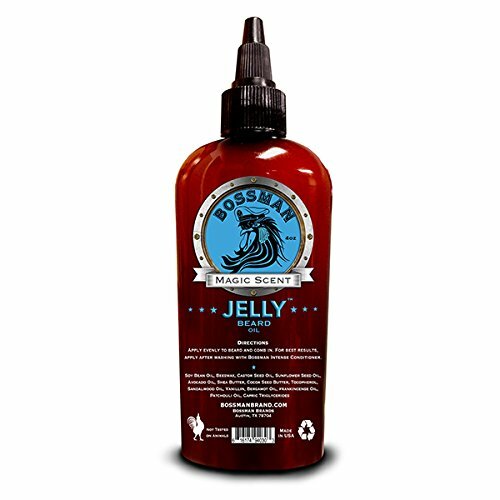 This jelly beard oil is a unique way to get your beard looking and feeling great. One of the best things about this product is that it opens up the pores, so that the skin becomes clearer and softer. Most customers use it twice a week and found that both their beard and skin are suppler and healthier. The geranium, vanilla, and lavender scent is strong enough to last the whole day without becoming overpowering. You do not have to worry about stickiness or oiliness, since this oil never leaves a greasy trail. For men who want a strong conditioner, this is one to consider. This completely unscented, natural, and organic beard oil is infused with vitamin E, argan oil, jojoba oil, evening primrose, and sunflower seed oil. With no fillers or additives, The Gentlemen’s Premium Beard Oil is perfect for those with sensitive skin as it prevents irritation. It also protects against natural split ends and treats split ends that come from trimming and shaving. The easy to use glass dropper comes included, and one bottle can last you for months, even when using it daily. Rub into your dry or damp beard after a shower, as either is equally effective. You won’t feel an oily and greasy beard after use; your beard absorbs this oil cleanly and the results are quick to behold. Say goodbye to dry, itchy skin and stray, stubborn hairs that poke out at all angles. Be prepared for the many compliments on your soft and shiny beard in the days and weeks to come. The iconic and minimal bottle and packaging design makes it look good on your shelf as well, or make it a great present for your best bearded friend (though you will probably want to keep it for yourself after trying it). If you have a beard that doubles as sandpaper and are looking to change that without dripping beard grease all over your new suit or smelling like a floral shop, then The Gentlemen’s Beard Premium Beard Oil is for you. This beard oil has stood the test of time with its eight premium oil ingredients. 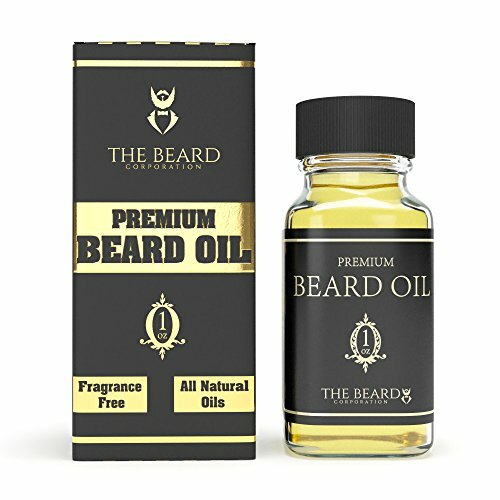 All natural and pure avocado oil, sweet almond oil, apricot kernel oil, golden jojoba oil, virgin argan oil, kukui oil, moringa oil, and virgin pumpkin seed oil make up this effective beard elixir. 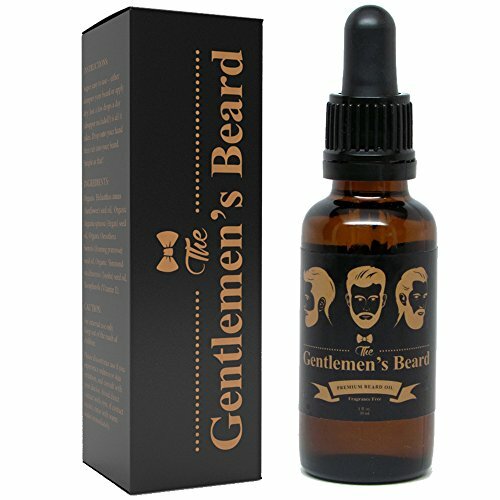 This wonderful mixture smooths and relaxes the texture of bristly beards, relieves the irritation and itching of new beards, promotes hair growth and fullness for better beards by stimulating healthy blood flow to the hair follicles, and does a great job of hydrating the skin behind the facial hair. This leads to a thick and handsome beard without tangles and the dreaded dandruff problems. 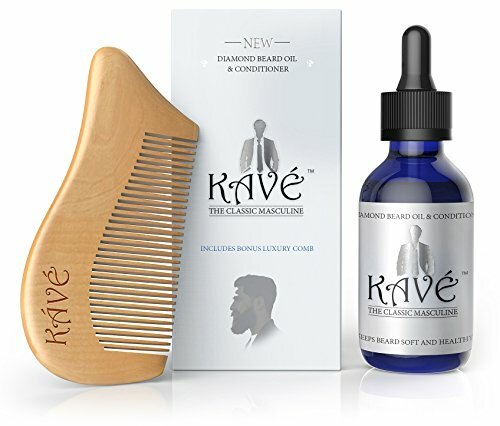 Your beard will have a noticeably different feel to it, becoming soft, smooth, and easily manageable after just a few days of using this product. 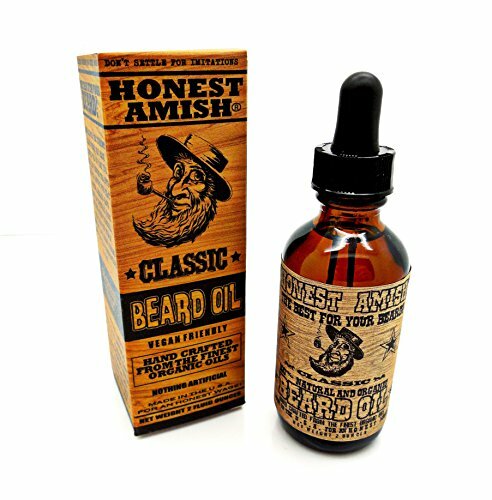 Honest Amish’s long history in providing beard care products proves their ability to create a beard oil to surpass all beard oils. Despite the use of so many oils, this beard elixir maintains a classic and manly scent that doesn’t overwhelm. It also avoids the greasiness and stickiness that other beard oils leave. If you want your beard to shine like the sun with a natural healthy glow, and be soft and kissable to boot, then Honest Amish is your best bet. Beardsmen Spirit Premium Beard Oil has everything you want in a beard oil in one convenient bottle. The bottle itself is a handsome beauty to look at, as is the packaging it came in. The great packaging hides a great product inside. Boasting a bottle four times bigger than most other competitors, this oil softens and detangles beards, keeping everything nice and neat and silky smooth. It also stops itching from new beard growth and those with dandruff problems. Despite being an oil itself, this product is lightweight, non-greasy, and won’t make your beard feel oily all day long. The beard elixir is infused with almond oil, castor oil, grapeseed oil, and jojoba oil, plus the three essential oils that make up its scent. The smell of eucalyptus, cedar, and pinewood brings to mind a lush and pristine forest, perfect for men who love the manly scent of the great outdoors. The smell is long-lasting, ensuring that freshly groomed beard won’t go unnoticed. As a bonus, you can rest assured knowing that this product is all-natural and made in the United States. Beardsmen Spirit Premium Beard Oil brings vibrancy to beards once scraggly, great for cleaning up your appearance and reputation as a bearded man. You won’t be disappointed with this one. The Manskape Co. brings to the table its chemical and preservative-free premium beard oil, handmade in Georgia, USA. With no fragrances or colorants in their product, it instead contains a whopping 10 oils, vitamins, and essential oils. Among the ingredients are apricot kernel oil, grapeseed oil, golden jojoba oil, castor oil, argan oil, emu oil, vitamin E, tea tree oil, cedarwood essential oil, and rosemary essential oil. These claim to condition, grow, strengthen, moisturize, and revitalize your beard, giving you or your favorite bearded man healthy, manly, and handsome chin locks. Wild Willie’s fights against dandruff, skin irritation, itching, and split ends with its anti-fungal, anti-inflammatory, and antibacterial properties. Wild and coarse beards transform into a soft and manageable beard with daily use of this beard elixir. The manly and pleasant smell is that of herbs, reminiscent of tea tree oil and your favorite traditional barber shop. The clean scent complements the design and feel of the entire product. The old-timey look of the pump bottle and interesting packaging make this a great choice for a gift or bathroom counter centerpiece. It even comes with a drawstring bag, which is probably unnecessary, but considered to be a great touch to the overall package of the product. The results of this beard oil speak for themselves. Everyone will notice the change in a beard after a bit of Wild Willie’s. Unlike other beard oils on the market, Leven Rose believes in simplicity, valuing quality over quantity. Thus, they only use two ingredients in this best-selling beard elixir: organic, cold pressed, unrefined jojoba oil and Moroccan argan oil. That’s it! You won’t find a single filler, fragrance, additive, paraben, or GMO in your Leven Rose beard oil. It’s vegan friendly, and never been tested on animals. Featured in GQ, this beard oil has won hearts, minds, and beards the world over for its high quality. It is especially ideal for men who want to grow out their beards, men who frequently sweat, go swimming, or expose their beards to extreme swings in temperature. Truly fragrance free, this oil is also perfect for men with sensitive noses or who like to wear their favorite cologne without clashing scents. The two ingredients are all you need to revitalize and strengthen your beard and prevent beard itch from new growth. Unlike other oils currently available, this product is lauded for its effectiveness, even if you shower or skip a day of use. It keeps your beard lush, knotless, and healthy throughout the day and night. The convenient glass dropper is provided with the bottle, and is all you need to keep your beard looking great. Leven Rose Beard Oil has anti-oxidant power and a simplicity that beats out its competition, therefore earning its spot on this list. You can’t go wrong with simple and effective. Leven Rose might be the one for you. With so many to choose from, there’s a beard oil out there for everyone, and it can be a lot of fun to shop for beard grooming products to experiment with. Most beard oil companies offer 100% Satisfaction Guarantees and refund products quickly and easily if something isn’t right, so there’s nothing to lose from experimenting with different oils. Treat your beard right, and find the beard oil that works for you. All of these beard oils are worth considering if you want to give your beard a boost. Some of them are pricier than others, so keep that in mind when searching for the right option. Consider ingredients carefully, too, especially if you have sensitive skin or if you have allergies. By taking the time to research on the beard oils available, you will be able to find the right option for your skin type and beard type.